And not before time, of course. The only reason we had kept one for so long was not for sending messages, but because we still occasionally received purchase orders from other NHS organisations by fax. When completing new supplier set-up forms or standard tender documentation, it’s still not unusual to be asked to provide a fax number. But as the ribbon on our fax machine finally gave up the ghost after 15 years of loyal service and zero maintenance, it was time to be ‘decommissioned’ (by which I mean retired to the hardware graveyard that is our store room). And ironically we did this just two days before the use of fax machines in the NHS actually hit the headlines…freedom of information requests having revealed there to be 9,000 fax machines still in use across the NHS, with one NHS trust alone holding the dubious pleasure of owning over 600 machines! The NHS as a whole holds the even more dubious record for being ‘the world’s largest purchaser of fax machines’, whilst a further report suggests that the NHS spends over £137,000 per year on fax maintenance costs alone. There’s no doubt that whilst certain parts of the NHS enthusiastically embrace cutting edge technology – as evidenced by the use of robotic surgery and artificial intelligence, some more traditional back office functions are less keen to modernise. As the NHS celebrates its 70th birthday, it’s more important than ever to reduce unnecessary spend on technology that belongs to the past. 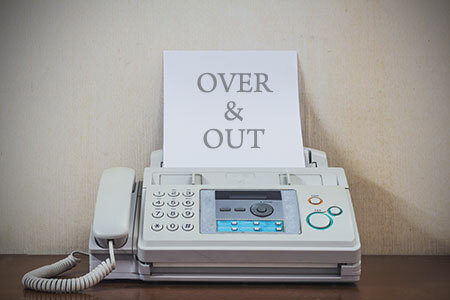 So as we send our own ‘You’re fired’ message to the NHS Creative fax machine, we hope other NHS organisations will follow suit.